These adrenaline-packed events won't disappoint. There may be single-digit temperatures in Pyeongchang, South Korea, but things are heating up at the 2018 Winter Olympics. TODAY's Savannah Guthrie, Hoda Kotb and USA TODAY sports columnist Martin Rogers partnered to give you a quick guide to some of the athletes and must-see Olympic events to watch this week. The alpine skiing at these Olympics has been crazy to watch. Lindsey Vonn might have had a rough start in the Super G but the downhill is her Olympic event and I have confidence that she’ll perform really well. I’m especially looking forward to seeing Mikaela Shiffrin also in the mix in the downhill and combined and maybe we could see two of our favorite American skiers on top of the podium together. It’s the Olympics, you never know what could happen, that’s what makes it so exciting to watch! “One of my favorite events at the Olympics is figure skating. We already saw Team USA flex their muscles taking bronze in the team event and now with the ladies singles and ice dancing coming up, we’re looking really strong. Maia and Alex Shibutani are my pick to take home a medal in ice dancing and we have three really strong ladies competing in the singles event — Mirai Nagasu, Karen Chen and Bradie Tennell and I could see any of them making a run at a medal here in Pyeongchang. We’ll just have to wait and see what happens! My first prediction is something that is a little against the odds. American speed skating has been completely in the doldrums but there are some signs that things could be about to get seriously exciting. 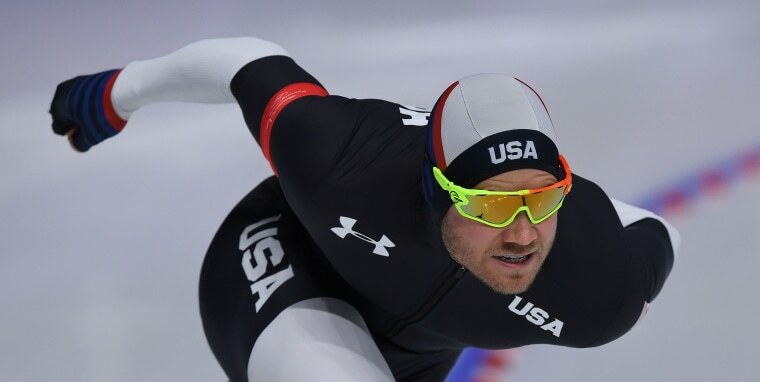 John-Henry Krueger broke a two-day drought for the entire U.S. Olympic team by grabbing silver in the 1000m short-track. With that confidence behind him it'd be no shock to see him hit the podium again in the 500. On the long track, keep an eye on a brand new event — the men's mass start. It is great fun because it's like NASCAR on ice, 20-plus racers all trying to occupy the same space. Even better, an American is reigning world champion. He's Joey Mantia, he's an Armani model, and he's peaking for this one. In ice skating, Mirai Nagasu is by far the best American shot at the podium. Modern figure skating rewards bravery and personality. She has the triple axel and she has the sparkle, the crowd will respond to her and the judges are often swayed by that. Finally, Lindsey Vonn may well win the downhill but she's already a winner, having dealt with Twitter trolls with class and dignity. For the latest Olympic news and to watch the games online, click here.